The vertical pick-up lathes in the VL series represent a new machine concept from the EMAG Group: modular machines. With the aim to develop a system of modular machines ideal for use in the manufacturing of medium and large batch runs, one common feature of all the new EMAG modular machines is the shared basic, compact design. Their small footprint means reduced floor space costs and flexibility in machine layout (for example, Chaku Chaku or closed loop arrangement). Every VL machine features an integrated O-automation system for transporting workpieces on its left-hand side. When combined with the self-loading pick-up spindles, this automation concept ensures short cycle times and high productivity. To accommodate machine operators, all the service units are easily within reach, with the various units (electrics, hydraulics, cooling system, cooling lubricant and central lubrication system) accessible at any time so that the machines can be maintained with ease. The VL series vertical pick-up turning machines were specially developed for manufacturing precision chucked parts with machines available in 4 sizes to cover as wide a range of project sizes as possible. The smallest machine, the VL 2, is designed for components up to 100 mm in diameter, with the VL 4, VL 6 and VL 8 machines increasing the size of the workpieces that can be handled by 100mm each. With these options, the VL series covers a variety of workpieces and accommodates components up to 400 mm in diameter. Each VL machine features a tool turret with up to twelve (driven) tools, which ensures short swiveling times and, therefore, falling cycle times for machining chucked parts. 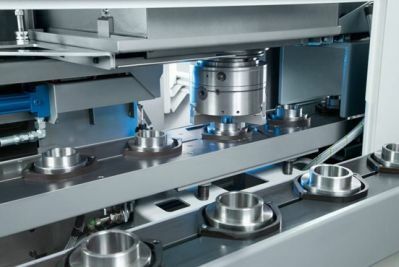 Furthermore, the lathes can be fitted with a Y-axis in the turret to allow for the machining of complex geometries to increase the possible fields of application for the VL product family. The entire machine concept is based on maximizing component quality. The machine body is made of vibration-absorbing MINERALIT® polymer concrete. 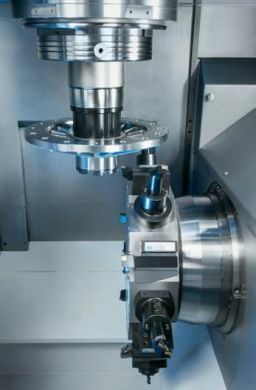 Together with the self-loading, high performance spindle, which completely eliminates clamping errors, these design elements ensure perfected machining. The vertical layout creates ideal chip flow conditions, as chips naturally fall down and out of the machining area, bringing an end to time loss due to operators clearing nests. Every VL machine can be fitted with an optional measuring station located outside the machining area between it and the pick-up station, allowing for integrated quality control. Measurement thus becomes a cohesive part of the process during transportation to the loading/unloading station, optimizing time while ensuring quality.